Every day around the globe Alfaxan Multidose Intravenous Injectable Anesthetic is used in thousands of anesthetic procedures. Its effectiveness, wide safety profile and versatility is raising the bar for injectable agents used in induction and total injectable anesthetic procedures. Drug use and dependence: Alfaxalone is a class IV controlled substance. Biochemical and research data suggest that alfaxalone has a similar abuse and dependence potential to other class IV drugs such as benzodiazepines and barbiturates. Alfaxalone produces anesthetic effects via enhancement of gamma-aminobutyric acid sub-type 1 (GABAA) receptor-mediated neurotransmission. GABAA receptors are widely distributed throughout the mammalian Central Nervous System (CNS). GABA is the major inhibitory amino acid transmitter of the mammalian CNS and receptors are present on almost half of all neurones.3 GABA acts by opening a pore in the receptor allowing the in-flow of chloride ions, causing hyperpolarization. Alfaxalone’s enhancement of GABA’s effects prevents development of action potentials and stops impulse transmission. Click through to the sections below to find out more on each topic. The alfaxalone molecule was formulated as an anesthetic agent in the early 1970's, but side effects limited its use. In 2000, Jurox incorporated alfaxalone into a cyclodextrin carrier creating Alfaxan. Users began to enjoy the safety and effectiveness of the drug without the side effects. Alfaxan Multidose is a clear, aqueous isomolar solution with a pH of 6.05 to 7.0. It is presented in 10 mL single-use vials and does not contain a preservative. Alfaxan Multidose is metabolized in the liver and eliminated in bile and urine within a few hours after administration. Unpremedicated cats and dogs typically remain anesthetized for 25 and 10 minutes, respectively, from a single dose. Cats and dogs have demonstrated acute overdose tolerances of five and 10 times the recommended dose, respectively. Cats tolerate repeat overdoses of five times the recommended dose administered every 48 hours for three doses. Think Anesthesia is Jurox’ proprietary anesthesia education program for veterinarians, veterinary nurses and technicians. For the latest educational content and CE-certified programs. 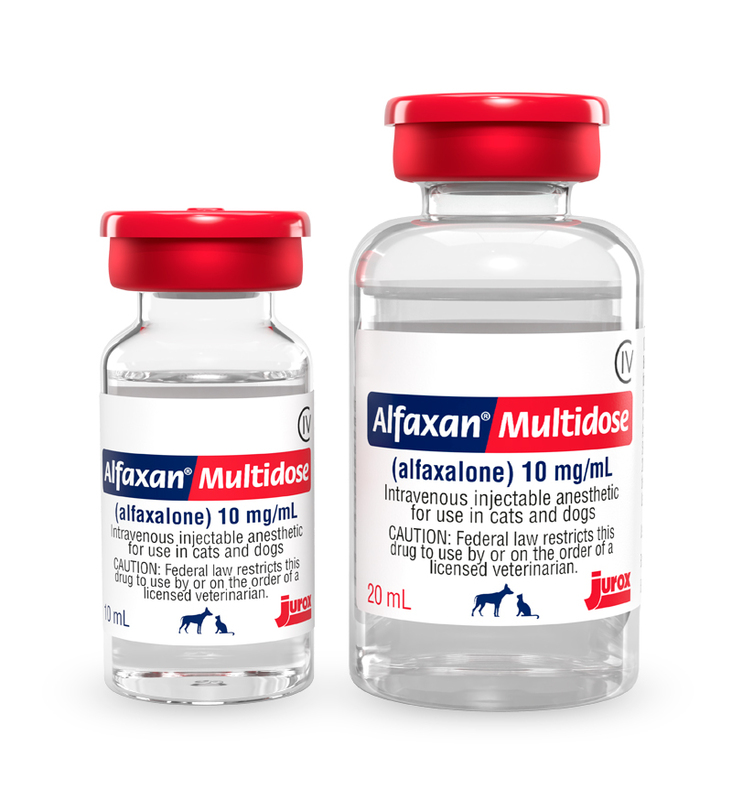 Alfaxan is indicated for the induction and maintenance of anesthesia and for induction of anesthesia followed by maintenance with an inhalant anesthetic, in cats and dogs.